How can I read & write files from Verilog using the PLI? What are some other PLI applications? Where can I learn more about the PLI? The Programming Language Interface is a way to extend the functionality of Verilog simulators. Why try to build every possible feature into a tool? The PLI lets you add your own custom applications such as C models, delay calculators, file I/O, and more. My first piece of advice with the PLI is to not use it. Why? Because if you can do something in Verilog, it is more clear and easier to maintain and reuse. For a simple device, write a model in Verilog before trying it with the PLI. The next level are the ACC routines, which can access any signal in the design. These can be used when for delay calculators and waveform dumping applications. The third level are the VPI routines which use a cleaner, object-oriented interface. The newest level is "DirectC" type which allows Verilog code to call C code directly without any wrapper code. (The name I am using comes from the VCS implementation. SuperLog also has a Direct interface.) This PLI level trades off functionality (no event scheduling) with performance (up to 5x faster, and less memory). Read and writing files from Verilog - Now you can read any format file into your model, and open hundreds of output files. Used by dozens of companies around the world. If you are using the latest version of VCS, NC-Verilog, and ModelSim, this is already built into your simulator. Download the latest file I/O routines for Verilog, currently v3.6 (released 8/31/04). (If you see a page of text when you download, try the uncompressed version, or do a File > Save As > "fileio.tar" as your browser may be automatically decompressing the file.) Read about this PLI application. v3.4, 11/6/02 Added $fgetc to fileio.tab, gets() is disabled by default, added to the Fileio/IEEE differences section. v3.3, 10/28/02 Fixed some documentation problems, especially around VCS and Verilog-XL. Read fixed patterns Updated 10/17/03Here is an application to read pattern files without having to be a programmer. Strobe Compare - Compare the results from two Verilog simulations. Find X - Locate the unknowns in your simulations. Great for debugging reset problems. Updated 10/17/03. Write Stdio - How to use the VCS file pointer for stdout - useful for C programmers. Your own idea - Ask me for help writing a new PLI application. Please note: if a task can be done in Verilog, it will be easier to debug, probably run faster, and be more portable than writing C code with a myriad of PLI calls. So don't ask for the C equivalent of a Verilog module. Verilog PLI Handbook - Stuart Sutherland has written great book on the PLI with detailed explanations and examples. His encyclopedic knowledge of the PLI makes this the most comprehensive guide available. Check out his site and place your order with him. Even if you only use one example, it will be worth every penny. 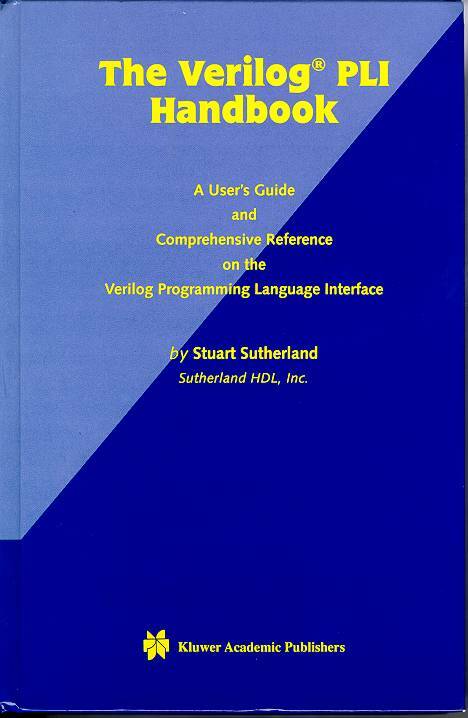 Stu has also published Verilog 2001, A Guide to the New Features of the Verilog Hardware Description Language. A great reference for anyone wanting to know more about what has changed, but does not want to wade through the IEEE manual.